Back in July when I drove my car solo from Cincinnati, Ohio to my daughter’s wedding in Seattle, Washington, a drive of 2,640 miles over 40 hours of driving in four days, I posted thoughts, observances and inspirations on Reflections of a Lay Catholic each day. It had been years since I had made a drive like this on my own and, even though I would miss my wife and youngest daughter (who were flying to Seattle), I was looking forward to it immensely. Mainly I was looking forward to the quiet time, the absence of work and other responsibilities that tend to fill up my life. And, at some point it dawned on me that it would be a good opportunity for me, in my new found faith, to try to get closer to Jesus, to spend some one-on-one time with Him. After three days of driving and blogging about: attending Masses at the Cathedral Basilica in St. Louis, Missouri, St. Joseph’s Cathedral in Sioux Falls, South Dakota (including confession), and St. Therese the Little Flower church in Rapid City, South Dakota; the inspiring and friendly people I met at each church; praying the Rosary for the first time on my own, and seeing the beautiful countryside that is God’s creation, I felt I needed to explain why I was praying my way across America. So, in my post from day three, Bolo Ties, Rosaries and Rainbows, I explained that there were many people in my life who needed my prayers, one of which was my wife who would soon be having breast cancer surgery. And, I explained, that I tend to do my best praying, or at least it seems that way to me, while I am in church. I found, too, that the prolonged absences of distraction while I was behind the wheel allowed me to continue that praying throughout the day. A friend and follower, when reading that I was enjoying this alone time with Jesus, astutely claimed that it may very well have been that my whole trip unfolded in this way because He needed some alone time with me! Don’t you love it when something simple gets turned around and you discover something even more beautiful than what you originally had? In another recent post I mentioned how praying is something I’m still getting used to doing. I’m satisfied with the frequency but it’s the content that needs some work. I tend to ramble. I need to be more succinct so I can fit it all in when I only have a short amount of time. I have found, though, that my time in prayer is tremendously more satisfying, with less pressure on myself to “perform”, when I schedule to spend a full hour in Eucharistic Adoration once a week. 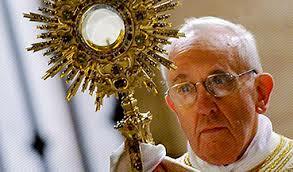 So, what is Eucharistic Adoration you ask? Well, let’s say that while receiving the Eucharist during Communion at Mass is the best way to personally experience Christ within our parish community, Eucharistic Adoration gives us the opportunity to be with Him up close and personal, or one-on-one. We can experience this in two ways. The Consecrated Hosts reserved from the previous Mass are kept in the tabernacle, usually a small, ornate enclosure with a locking door resting on a table behind the altar. 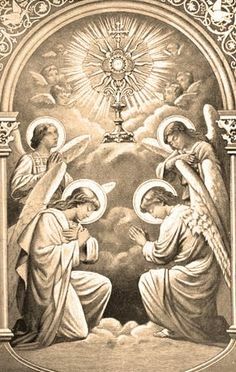 The easiest and most common form of Eucharistic Adoration is to stop by church at any time and genuflect (kneel) facing the tabernacle and acknowledge Christ’s presence. The second way, and in my opinion the most profound and satisfying way, is when the Blessed Sacrement is removed from the tabernacle and exposed for adoration in a monstrance, a sculpture with a glass enclosure that reveals the Host. Like the first example, adoration is accomplished by genuflecting in Christ’s presence and it is usually done for an hour. What is significant about an hour, you ask? Well, that comes from when Jesus, after agonizing in the Garden of Gethsemane, finds his disciples sleeping. Upon waking them He asks Peter, “So you could not keep watch with me for one hour?” – Matthew 26:40. Poor Peter, he couldn’t seem to get anything right. Sometimes I feel like him. Do you? 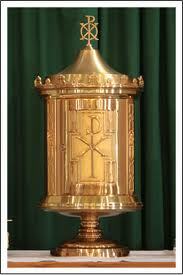 I have had the opportunity on two occasions to spend an hour in adoration when the Blessed Sacrament was exposed. Both of those instances were during Christ Renews His Parish retreat weekends. But, this summer, I have spent several more hours on Saturday mornings in adoration, when the Eucharist was not exposed, as a time for sacrificial prayer in support of our church’s Adult Faith Formation group. One of the group’s responsibilities is to bring Perpetual Eucharistic Adoration back to the parish and in support of that effort we each take a day to fast and one hour a week to pray in adoration before the tabernacle. Our prayers are for help and encouragement to the parish community to discover the glory of adoration and for their participation. In order to have a successful program for a 24/7/365 Perpetual Eucharistic Adoration about 450 people are needed to participate. Most adults I know are married, have a significant other, and/or have children. Imagine the sadness we would have if we couldn’t spend at least one hour a week with the ones we love more than any others on earth. Then, imagine the ridiculousness of accepting that it would be okay to not schedule at least one hour a week to devote to the one’s you love the most. Now convey those thoughts over to our relationship with Christ. Can we not spend one hour per week getting to know Him better and letting Him help us get to know ourselves better? By doing so, will we not be able to love our families and friends here on earth more fully? When we get this off the ground, my hour is going to be from 5:00 until 6:00 a.m. on Monday mornings. You’re welcome to come join me.